Formworks for In-situ Concrete Work is defined as “A mould or box into which wet concrete can be poured and compacted so that it will flow and finally set to the inner profile of the box or mould.” Formwork can be made using molds out of steel, wood, aluminum and/or prefabricated forms. 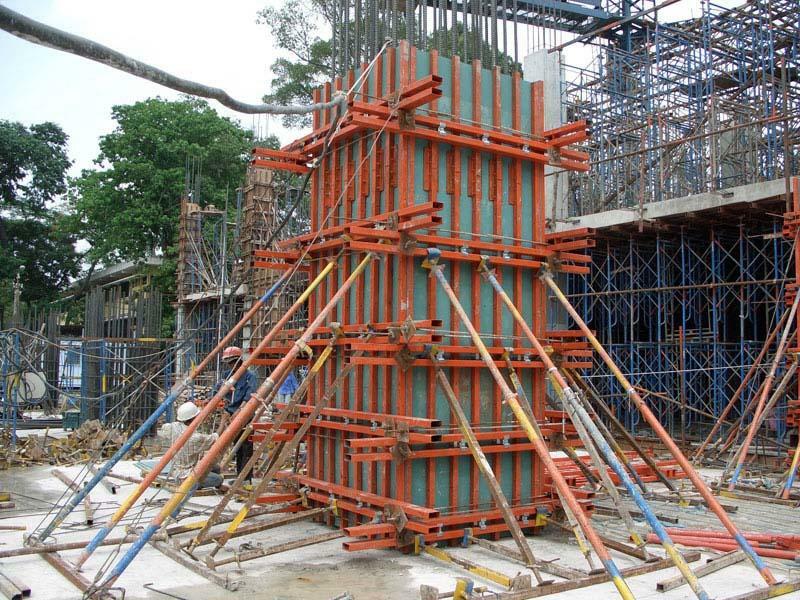 Formwork is an ancillary construction, used as a mould for a structure. Into this mould, fresh concrete is placed only to harden subsequently. The construction of formwork takes time and involves expenditure up to 20 to 25% of the cost of the structure or even more. These are Temporary structure required to safely support concrete until it reaches adequate strength. Forms mold the concrete to desired size and shape and control its position and alignment. Formworks also act as a temporary structure that support: it’s own weight + The freshly placed concrete + Construction live loads (material, human, logistic). Formwork is a classic temporary structure in a sense that: It can be erected quickly and it is Highly loaded for a few hours during the concrete placement. Within a few days it is disassembled for future use like any other temporary structure. Safe and Cost effective or economical. High Quality – finished concrete surface is of acceptable quality- in the correct location- able to produce the required shape and surface. Strong enough to withstand all types of dead and live loads – Rigidly constructed and efficiently propped and braced both horizontally and vertically, so as to retain its shape.The joints in the formwork should be tight against leakage of cement grout. Construction of formwork should permit removal of various parts in desired sequences without damage to the concrete. The plan of the building should imply minimum number of variations in the size of rooms, floor area etc. so as to permit reuse of the formwork repeatedly. Design should be perfect to use slender sections only in a most economical way. Minimum sawing and cutting of wooden pieces should be made to enable reuse of the material a number of times. The quantity of surface finish depends on the quality of the shuttering . If the timber is dry, it will absorb moisture from wet concrete which could weaken the resultant concrete member. Timber with high moisture content (more than 20 % moisture content), wet concrete will shrink & cup leading to open joints & leakage of grout. This is by far the most common material used for the facing panel. It is easily cut to shape on site, and if handled and stored carefully, it can be used many times. A standard plywood thickness on site is 18mm. This is usually sufficient for most pours. However, if the formwork is curved, a thinner plywood is used to facilitate bending. Thicker plywood may be used when the weight of concrete causes a standard thickness plywood to bow out, distorting the concrete face. Often used in pre-fabricated formwork, that is put together on site. Aluminium is strong and light, and consequently fewer supports and ties are required. The lighter sections will deflect more, but this can be avoided by simply following the manufacturers recommendations. Glass reinforced plastics (GRP) and vacuum formed plastics are used when complicated concrete shapes are required (e.g. waffle floors). Although vacuum formed plastics will always need support, GRP can be fabricated with integral bearers making it self supporting. Like steel, plastic formwork can be re-used many times, as long as care is taken not to scour the surface whilst vibrating the concrete.